Mark the Date!!! 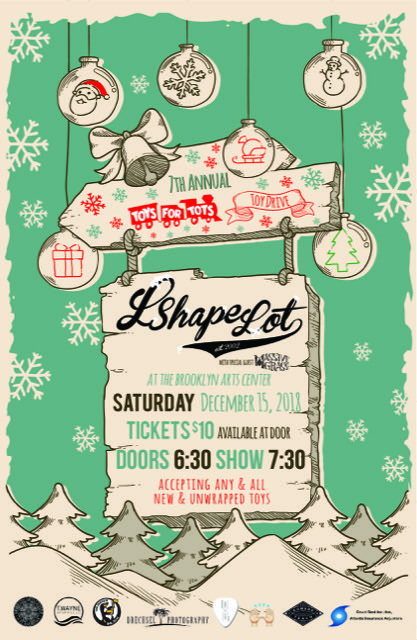 On December 15th, 2017 L Shape Lot is hosting their 7th Annual Toys for Tots Fundraiser, at the beautiful Brooklyn Arts Center, along with special guest Massive Grass. Last year, with your help, over 1400 individual toys were collected, along with a $2000 donation, and we are hoping to exceed that this year. We ask you to mark your calendar, tell a friend, invite a friend, and come be a part of a magical evening while helping others.